During School Spirit Week, students celebrate their school pride by participating in activities related to the school's sports teams, wearing school colors and competing in special spirit week contests. Spirit Week is usually held during the week before the school's homecoming, but any week of the year can be used. While School Spirit Week is a lot of fun, coming up with creative ideas every year can be a challenge. One of the parts of School Spirit Week that students enjoy the most is dressing according to a different theme each day. The more creative the spirit week themes, the more fun it is. Make sure photographers take a lot of photos for the yearbook and award daily prizes to students from each grade level who exemplify the day's theme. During twin day, students dress alike. Twin day is not limited to twins. Students can be triplets, quadruplets, quintuplets or any amount of people they can get to dress the same way. The goal of wacky tacky day is to dress as wacky as possible. This may just involve wearing an ugly shirt for some students, but others will go all out, mismatching socks and shoes, mixing pajama bottoms with fancy dresses, putting on a lot of jewelry and styling their hair in unique ways. The popular celebrities change every year, but dressing up like a celebrity never ceases to be fun for students. If students do not have a favorite celebrity to dress up as, let them dress up as a generic celebrity by wearing a red carpet worthy gown or tuxedo. Create a fake red carpet at the entrance to the school using bulletin board paper, and photograph the 'celebrities' as they walk into school. Dedicate one day as a more serious day and focus on dressing to advocate for a specific charity or cause. Have students wear pink to support breast cancer research or red for heart health. You may have a hat day, but require students to pay a dollar to wear their hat and send that money to a local food bank or other charity. From smiley faces to poop, emojis capture a feeling or object in a silly animated form. Ask kids to dress like their favorite emoji by using face paint to give their own face a specific look like a few giant tears on their cheeks for the crying emoticon. Many popular emojis have been made into Halloween costumes so kids could wear those or create their own facial expression emojis with markers and a yellow T-shirt. Run a contest for the most creative original emoji outfit. Spirit Week should be full of special activities for students. Include activities that are fun for students and that help them get to know their school better. Every School Spirit Week should end with a pep rally. During the pep rally, show a slideshow of some of the best outfits throughout the week. Give out awards for the best costumes throughout the week during the pep rally. The pep rally also provides an opportunity to get students excited for a big game or another school event. Introduce players on the football team or recognize senior athletes. Have the drama club put together a spirit week skit, the cheerleaders lead the students in popular cheers and the marching band perform a song or two such as the school's fight song. Make School Spirit Week a competition between the classes. Determine which class has the most participation during the dress up days and award the class adviser or class president with a special banner or trophy. 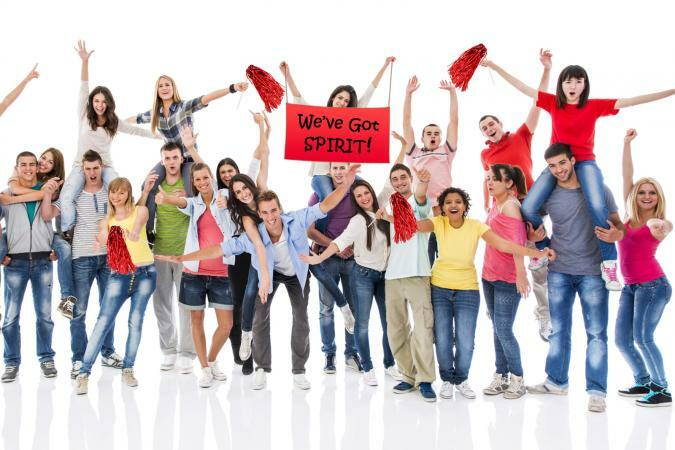 Have a noise competition during a pep rally to see which class can be the loudest during a cheering competition and award a special spirit trophy to the winning class. Turn the entire week into a competition to see which class can raise the most money for a local charity or collect the most canned goods for a food drive. 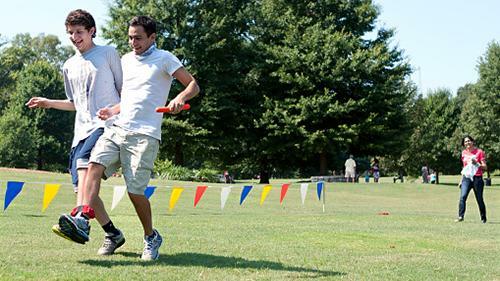 If it is warm enough outside, hold a field day competition during Spirit Week. Students will participate in three-legged races, sack races, tug-of-war, free throw contests and quiz bowls. Give out ribbons for individual winners in each event. Have each homeroom compete against the others by awarding points to each student who places in an event. Give a special trophy or ribbon to the teacher whose homeroom earns the most points. Students love to compete against their teachers. During Spirit Week, hold a basketball game, kickball game or volleyball game that pits the students against the teachers. Many students are not aware of the opportunities that exist in the school. Hold a club fair to introduce students to all of the clubs at the school. Give each club a table in the gym or cafeteria and have them create a display showing what their club is all about. Students may find a new club to join and will help lesser-known clubs boost their numbers. Host a schoolwide art contest where students create a new logo for the school. Kids should use school colors, the school mascot, and invent a motto for the year to include in their design. Hang all the options in a central location and give the students and staff a chance to vote for their favorite. Use the winning logo on limited edition spirit gear like T-shirts and create a poster to hang in a high-traffic area of the school with this new design and motto. Spirit Week is not complete without covering the halls of the school in school spirit. Have teachers decorate the doors of their classrooms to show their school spirit. Students in their homerooms can help too. Award a special gift certificate or pizza party to the teacher or homeroom with the best door. Create a large banner for each class using the school colors. Have each student in the class sign the banner. Dedicate bulletin boards in the school to be used for Spirit Week. Use a bulletin board to highlight special players on the football team. Cover a bulletin board with baby pictures of students or teachers. Feature pictures from Spirit Week on a bulletin board and update it as the week continues. Everyone loves a motivational cat poster or funny meme incorporating a pop culture character or phrase reference. Challenge each class to create a meme or series of memes following a singular theme like sports or cartoons. Kids and teachers can add images and school spirit sayings to poster board to create a unique meme. Take pictures of the meme posters and share them on the school and class social media pages or website pages. No matter what you do for School Spirit Week, keep the focus on the students and on having fun. During Spirit Week, it will be hard for students to focus in the classroom, so encourage teachers to incorporate Spirit Week into their lesson plans as well. Math teachers can write word problems incorporating teachers and students in the school. English teachers can create special Spirit Week journal entries. Social Studies teachers may be able to incorporate unique facts about the school into the beginning of every lesson. Let the students focus on building school pride throughout the week.